Higurashi no Naku Koro ni (ひぐらしのなく頃に?, lit. 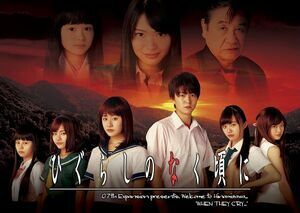 When the Cicadas Cry) is a Japanese television drama based on the visual novel franchise of the same name by Ryukishi07. The show stars Yū Inaba as well as several members of Japanese idol girl group NGT48. The series covers the first three arcs of Higurashi no Naku Koro ni; Onikakushi-hen, Watanagashi-hen, and Tatarigoroshi-hen. Early summer, Keiichi Maebara had just moved to a remote mountain village. As he becomes close friends with a group of girls, he was enjoying his life in the village. However when he starts to become suspicious that Rena Ryuuguu, Mion Sonozaki and the others that Keiichi trusted may be deeply involved in successive murders that occur every summer, the situation around Keiichi gradually starts to turn. As if the girls' characters had completely changed, a sewing needle is found in his food, he is chased by mysterious men, and is involved in an accident which could have killed him. He could no longer trust anyone, and then one mystery leads to another, bringing out a shockingly bloody ending. This page was last edited on 19 May 2017, at 05:04.